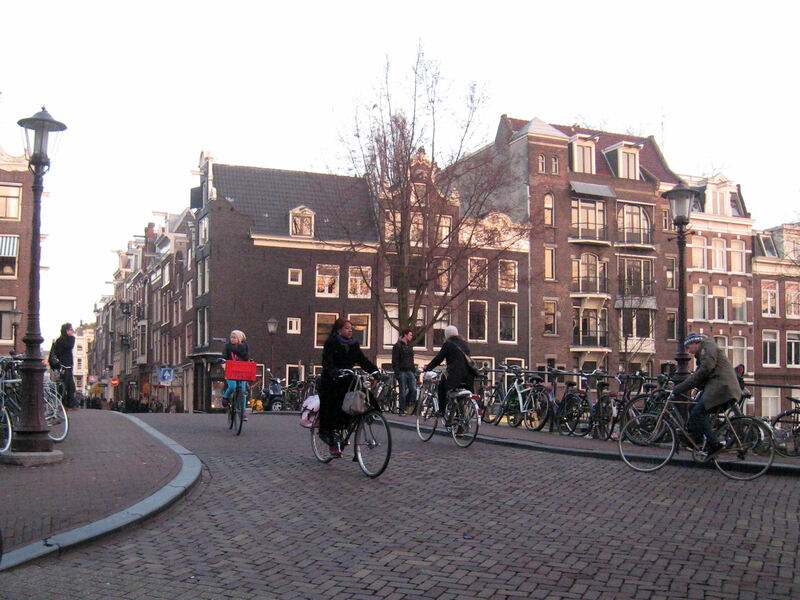 You don’t need to be in Amsterdam long to realize that the bicycle is an integral part of life in the city. The streets are teeming with bicycles transporting parents hauling their children, business people rushing from one meeting to another, grandmothers shopping, and young people going out for a night on the town. Designated street lanes and signals, flat terrain, and the profusion of narrow streets and one-way lanes conspire to make bicycle transportation the most practical means of getting around this busy city. In addition to the appeal of the bicycle alternative, car traffic in the city is discouraged by government initiatives. Parking places for autos are rare, and the fees for their use are expensive. Streets are narrow, and many are closed to car traffic. 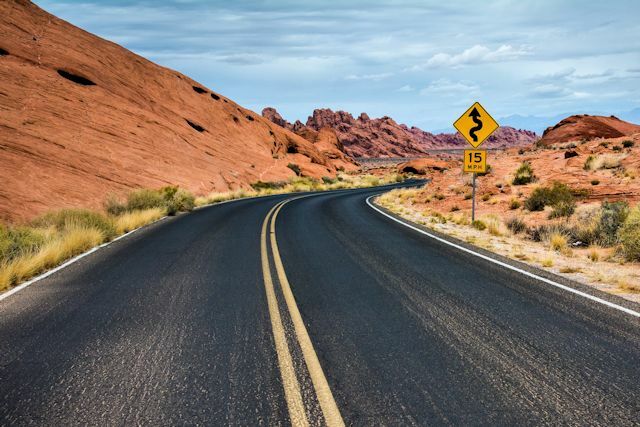 Wide highways exist only outside the city. 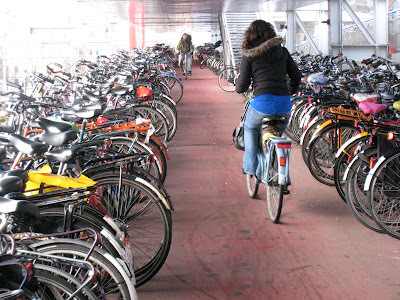 In a city with a population of three-quarters of a million people, estimates of the number of bicycles in Amsterdam range from 465, 000 to 700,000. 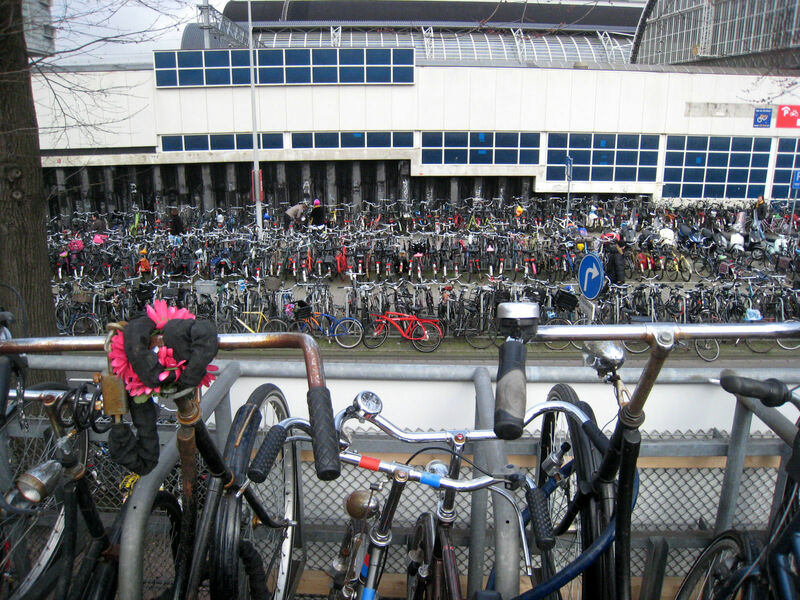 At the Amsterdam Centraal rail station, commuters can park their bikes in a bicycle parking area that holds more than 7,000 bikes. 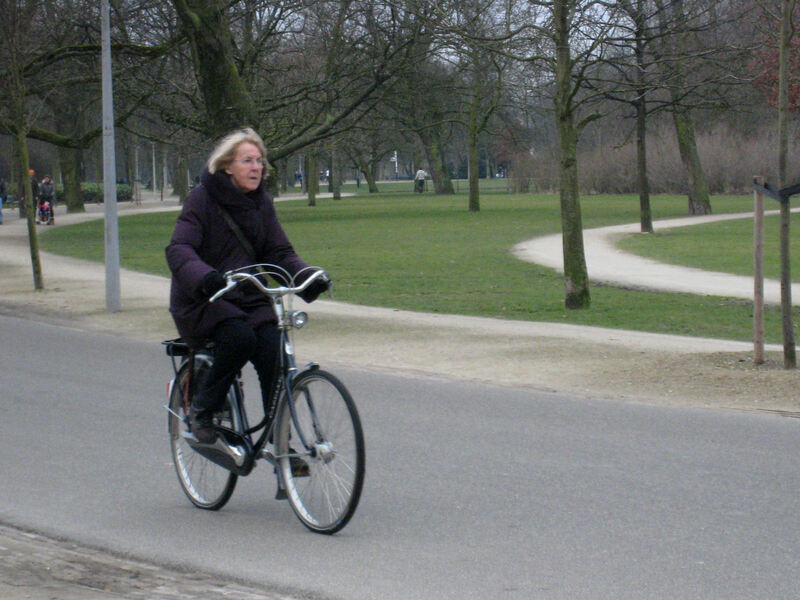 Safety-obsessed Americans are often appalled at the Amsterdam custom of riding bicycles without helmets. However, in a city with little car traffic and no high speed roads, the dangers faced by cyclists on U.S. highways don’t exist here. 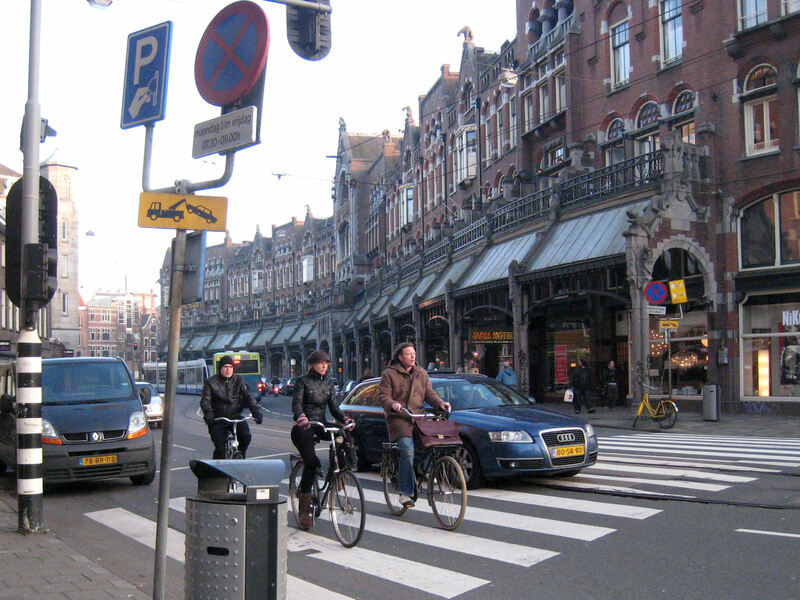 In 2007, Amsterdam had a total of only 18 traffic-related deaths from all causes, a statistic no automobile-centric city of similar size could challenge. Rental bikes are available for tourists to experience this quintessential Amsterdam experience. It’s not hard to pick them out; they’re the ones with the jiggling handlebars. Natives smoothly multitask as they glide along the streets, conversing with other riders, talking on their mobile phones, or even walking their dogs. They navigate without incident through many intersections with no stop signs to govern right of way. Bicycles are used by all socio-economic groups and ages. 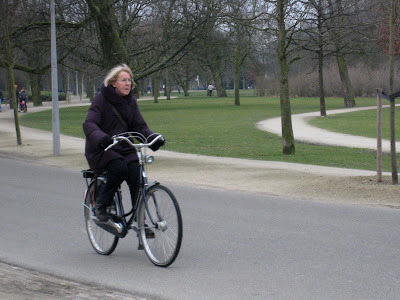 The Dutch prime minister even bikes to Parliament. Residents employ their bicycles to transport most anything from friends to groceries or even furniture. Specialty models are designed to carry one or two, or even four, children. Others sport attached carts for cargo. Despite measures to combat it, bike theft continues to plague the city. Most of the thousands of bicycles parked along city streets are of the touring bike style and are what one might reasonably call beaters. No Amsterdammer would leave an expensive bicycle unattended on the street. 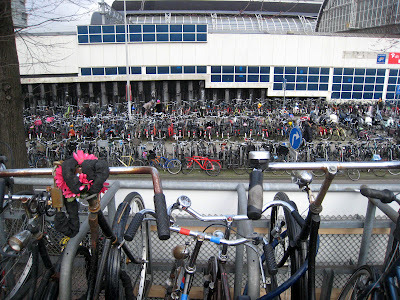 In fact, it has been said that “real Dutch” pay more for their bicycle locks than for their bicycles. When you depend on your bike as much as Americans do on their cars, having your means of transportation stolen presents a major inconvenience. 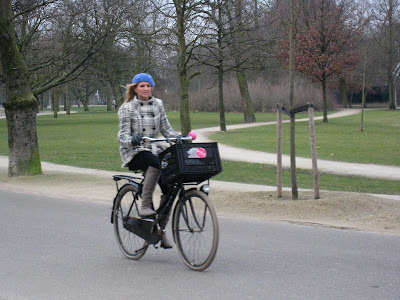 Once we learned to dodge the speedy two-wheelers and to remember that the bicycle lane was not part of the sidewalk, we developed a great admiration for Amsterdam’s bicycle culture. Not only does riding promote a healthier, more active lifestyle, the air pollution that automobiles bring to most urban environments is greatly reduced.